Download Barcode Label Software – Standard to make various types of barcode labels, tags and stickers for different industries. Software allows you to design customized and colorful barcode images in rectangle, ellipse and rounded rectangle shapes as per requirements. Data set series generating option is helpful to generate bulk barcode labels. 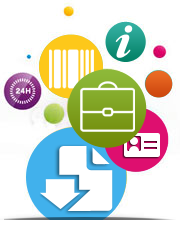 Creates professional labels, tags and stickers with the support of linear and 2d barcodes. No Technical knowledge required to operate barcode creatore application.